If you’re anything like me, you’ve been tempted more than once by the pretty vintage plates at thrift stores and estate sales. The good news is, some of them can be successfully used in glass fusing projects. Here’s a fun quiz question: Of the four plates pictured, can you identify the tempered ones? (The answer is at the end of the post) In the meantime, here are some clues to help you identify different types of vintage plates. Notice the thin pink glass next to the much thicker clear and yellow glass. Many thin vintage plates are made with borosilicate glass, a precursor to pyrex. Borosilicate is used by some lampworkers and in laboratories. 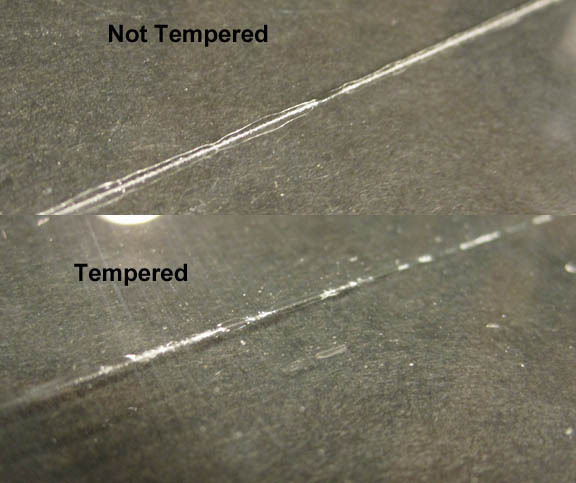 The thinness of the plate is an indicator that it is tempered. And frequently, vintage dishes have chips in the edges. The chips are good news in a way, they indicate the glass is not tempered. More crisp lines and square corners. The pink one and the red one. The clear and the yellow are soda lime glass and can be used for fusing. This is a votive made with a clear round vintage plate. I added some mica to the pattern just for fun. Notice how stretched out the pattern is on the base. These plates behave more like art glass than bottle glass, so use an art glass slumping schedule (or use the recycled slump schedule and subtract 100 degrees from the top temperature and the annealing temperature). Jewelry is another option, this bracelet was made from the yellow vintage plate, cut into shape, with the edges ground and then formed around a bracelet mandrel. Pendants are quite easy too, cut the glass into shapes, grind the edges, fire polish and add a bail. The patterns do the heavy lifting, and you’ll find that everyone has a fond memory of Grandmother’s candy dish.